Welcome to the MahJong Clubs Australasia Website. This site started as a dream during the Gympie tournament in 2011. It is our aim to continue to grow the site, adding clubs and information as it comes to hand. 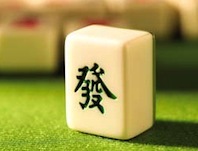 As players will know, MahJong is an ancient Chinese game which has been modified to the Western version our Clubs play. There being little to guide players, in 1990 Patricia Thompson and Betty Maloney published their first black and white book, "The Game of MahJong Illustrated". Betty was a painter and did all the illustrations by hand, even to the second and third books which are in colour. They sent out an invitation to anyone interested to meet them at Yarramalong for a weekend to discuss having a MahJong festival. Only 2 people turned up, Margaret Dearlove and Shirley Owers. This was in 1993. In 1994 the first festival was run by Patricia and Betty at Shoal Bay. Thereafter tournaments have been held every year. Venues include Shoal Bay, Byron Bay, Caloundra, Coolangatta, Brisbane, Norfolk Island, Coffs Harbour, Emu Park, Ballina, Gympie, Pelican Waters, Yeppoon, Hobart, Whangamata and Bundaberg. Clubs appearing on this site play Western style MahJong on a completely social level and not for commercial profit.